The Ministry of Research and Higher Education visited CAS Monday to honor the winners of Young CAS Fellow, a novel programme created in collaboration with the Young Academy of Norway. 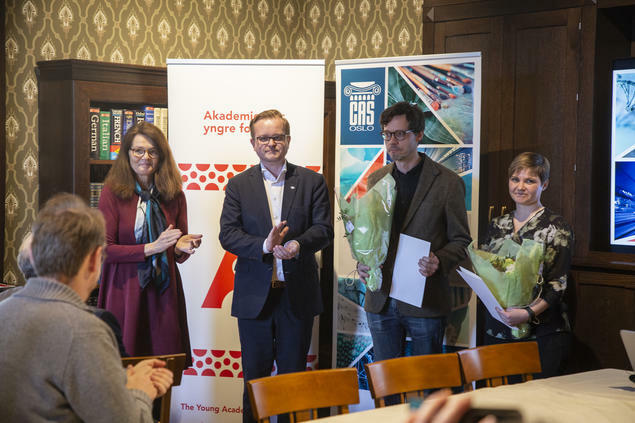 As winners of the Young CAS Fellow scheme, Hilde Nesse Tyssøy (University of Bergen) and Are Skeie Hermansen (University of Oslo) will gather leading experts of their choosing in three networking and researching meetings throughout the academic year of 2019/20. The CAS Board selected the two winners following a highly competitive application process. As a Young CAS Fellow, Tyssøy and Hermansen will receive a grant of up to NOK 175,000 each. The grant is intended to fund research projects and network building during the 2019/20 academic year. Following the handing out of diplomas, Tyssøy and Hermansen presented their projects for the Norwegian Ministry of Education and Research and other prominent guests at CAS. How much energy comes into the atmosphere? Hilde Nesse Tyssøy is a team leader at the Birkeland Centre of Space Science, a Norwegian Centre of Excellence at the University of Bergen. The overarching goal of the Birkeland Centre is to try to understand the Earth’s relationship to space. Energetic Electron Precipitation”, Tyssøy wants to find out when, where, and how much energy comes into the atmosphere. In her presentation at CAS, she explained that the sun is constantly sending a wind of electrons and protons towards Earth with a speed of an average 400 km/sec. ‘Luckily, our earth is shielded by a magnetic field’, she said. ‘We have inadequate measurements in a very complex system’. She explained that the focus of the research project will be on the loss of trapped electrons from the radiation belt into the atmosphere. 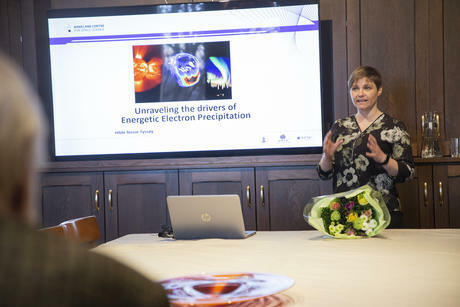 ‘We aim eventually to develop parameterization of energetic electron precipitation to be used in climate models’, she said. To do that, they need to have a comprehensive understanding of the causal connection between solar wind, magnetospheric processes, and the electron precipitation. ‘So I really hope that we will make some progress in unraveling the drivers of energetic electron precipitation the next one and a half year’. The second Young CAS Fellow winner brought us back to Earth again. ‘Overall, structural incorporation in the education system, and labor market of immigrants and their descendants, is one of the key challenges in the 21st Century’, said Are Skeie Hermansen as he introduced his project at CAS. With more than 250 million persons living permanently outside the country they were born, and with a strong migration drive towards Europe today, the issue is likely to be continuous. 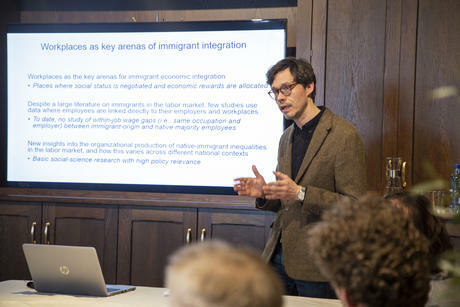 Studying immigrant economic integration, and how immigrants fare in the labor market, Hermansen’s project aims at addressing a small part of this overall topic. ‘But I will do this in a novel way’, he said, and explained that work places are the key arenas for immigrant economic integration. ‘It’s at work, at your local workplace, where you get your friends, and social status is negotiated’, he said. Preliminary results from Norway show that migrants are for different reasons sorted into occupations and workplaces with lower pay, and they experience lower wages within the job level. ‘In the second generation, however, these differences are largely disappeared’, said Hermansen. In his Young CAS Fellow project “Cross-national comparisons of within-job pay inequalities between immigrants and natives”, Hermansen will gather a team of researchers from Norway, Sweden, Denmark, Netherlands, Germany, France, Canada, and the US, and do similar analysis across these countries. ‘In this project, I hope to shed light on the organizational production of native-immigrant inequality in pay, and also differ on national context’. ‘Alternatively, these pay inequalities can reflect that people of immigrant origin and native majority origin are differentially sorted into occupations and work places, and we want to sort of sort out these mechanisms’, Hermansen said. Furthermore, the research group wants to understand whether these income inequalities relative to the native majority change from the immigrant generation to the second generation. Lastly, they will study whether immigrant-native pay inequalities vary across rich countries. ‘We also want to explore variation across workplaces, what type of workplaces fare better or worse, and what the characteristics of these workplaces are’, he said. 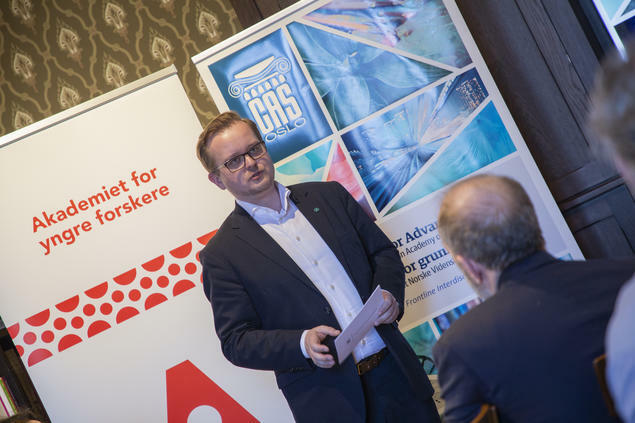 Kjartan Almenning from the Liberal Party of Norway, attended the event as substitute for the State Secretary Rebekka Borsch, and handed out diplomas to the Young CAS Fellows. Considering that one of the three main goals for the Norwegian government’s long-term plan for research and higher education is to develop academic groups of excellent quality, Almenning highlighted the importance of a Centre that facilitates just that. ‘Young CAS Fellow obviously plays an important role for young researchers who need time to develop new projects and establish networks’, he said. The Young CAS Fellow gives researchers the opportunity to grow their professional networks and create a foundation for collaboration at a critical point during their careers. This is a programme that extends CAS’ reach to researchers not eligible to apply to lead a CAS project at the Centre. Interested in becoming a Young CAS Fellow? The application portal for the 2020/21 academic year will open in fall 2019.